The default name chosen by the Console is created by appending copy to the end of the name. Thus, United States becomes United States copy. If you make a copy of United States copy, the proposed name will be United States copy copy. 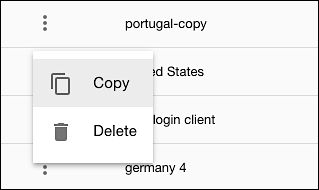 After clicking Copy property, the Copy this property dialog box is displayed. Note that, regardless of the method you use to copy a property, the new property will inherit the original property’s features, IP whitelists, and settings.